For Christians to live fulfilled lives and make on impact in the world, they must consciously identify the purpose for which God created them. This was the crux of the sermon delivered by the General Overseer of Divine Heights Bible Church, Abeokuta and Vice-Chancellor, FUNAAB, Professor Olusola Oyewole, at the 21st Annual Christmas Carol Service of the Chapel of Grace with the theme, “Jesus: The Author and The Finisher”. According to him, “God is a God of purpose and for every man He has created, there is a divine purpose and assignment for his life”. Professor Oyewole reminded the congregation that Christians all over the world celebrate the birth of Jesus at Christmas because He submitted Himself to fulfill the purpose for which He came into the world for the salvation of souls and deliverance of men. He further identified four steps, which can help each individual to fulfill the reason why they were created to be, “hooking your life to God, having a great vision for your destiny, becoming a friend of the Holy Ghost and being a fighter”. He admonished Christians not to despair, as God would always vindicate them. “As Christians, there can only be victors and never victims”, he added. Expressing delight at this year’s Carol Service, the Vice-Chancellor disclosed that it was special, as it was held on the day ASUU called off its strike and is the very first in which he as Vice-Chancellor, was ministering. 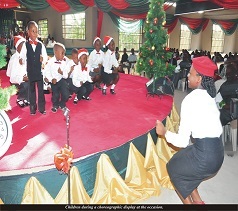 Highlights of the Carol included Drama Presentation, Choreography, and Special Numbers. 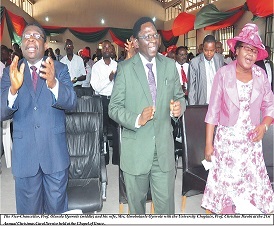 The service was attended by ministers of God from the Anglican church, Living Faith Church, Redeemed Christian Church, Chapel of Grace as well as Principal Officers and members of the University Community.